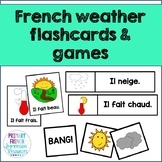 French weather flashcards and games - Quel temps fait-il? 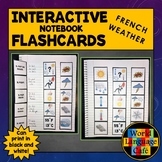 A set of flashcards with all the different types of weather. 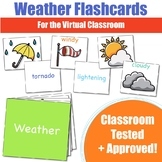 A fun way to test your students knowledge on the weather. Spanish Weather Flashcards on single 8.5x11 page 10 Spanish weather flashcards on single 8.5x11 page. 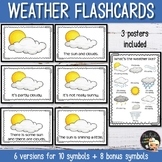 •	Clip art and English on one side •	Spanish and Spanish pronunciation on other side Vocabulary terms: •	Hace buen tiempo. •	Hace mal tiempo. •	Hace calor. •	Hace frío. •	Hace fresco. •	Hace sol. 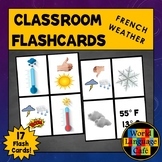 FRENCH weather flashcards / Étiquettes "Le temps" QUEL TEMPS FAIT-IL? 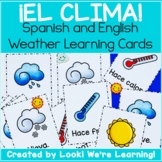 Spanish Weather Flashcards - ¡El Clima! 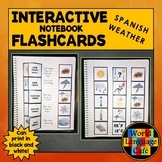 Also included in: Spanish Flashcard Learning Bundle - ¡Aprendemos Español!